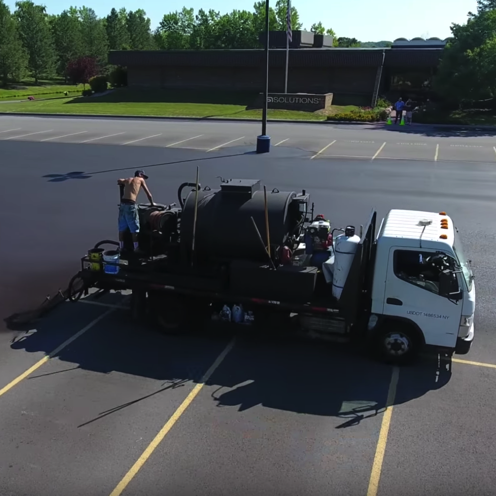 Since 1994, College Bound Sealers has been providing uncompromising and timely service throughout the greater Rochester, NY area to commercial, residential and industrial asphalt paving customers, from the initial paving application to the ongoing seal coating and surface maintenance. Our local/family-owned company has always strived to deliver the best service possible, from the initial prep work to the final striping and project cleanup, communicating with our customers every step of the way and ensuring optimal results from your investment. Your One-Stop Asphalt Maintenance Solution! Don't take our word for it, listen to our happy customers! I just wanted to say thanks for a great job patching pavement today. Despite the patches being in high traffic areas that had literally hundreds of vehicles going through, your guys maintained a high level of calm and professionalism. Having Mark onsite to assist with traffic directions and little issues made the job flow well and gave us a high quality finished product. I hope the sealing and striping go as well. College-bound did an incredible job with the installation of a brand-new driveway for my home. As a local Real Estate Broker I have seen and dealt with a multitude of contractors throughout my 26 year career. These guys not only did an incredible job, they communicated well, their pricing was competitive and their warranty is much better than the competition. It’s always a pleasure to do business with hard-working, honest people. Just want to say that I’m impressed, and I don’t impress easily! I will definitely recommend them to my friends, family and clients.